‘Everything’s four weeks late’. So said my friends and fellow gardeners Derek and Mary Manning in April last year (we were just emerging from the coldest winter in 50 years). This was when I wrote this last article in the series on gardening and climate change. You might remember Mary from my first article in the series. She’s the Norfolk gardener who’s been keeping records of when certain plants first flower each year – for over 60 years in fact. Over that time she’s seen a gradual creeping forward of when some spring flowers do their stuff, so supporting the evidence from elsewhere that the overall climate is warming in the UK and that Spring is starting earlier…. Yes, you did read correctly, spring is starting earlier! That is until 2013, when all the expectations flew out of the window as we had our coldest March for 50 years and, as any UK gardener will tell you, most plants were holding off until the real Spring arrived. The Manning’s evidence in 2013 showed that Scylla (the lovely purply- blue woodland bulb) flowered on the 4th April in 2013, almost exactly a month later than in 2012! Why do I share this information with you? Well, if you’ve been reading my previous articles in this series you will have gathered that recent events in the UK’s weather (and further afield) seem to be prompting some rethinking of the theories and forecasts of climate change and it’s expected effects. In my first article, I set out what the forecasts currently are and how these seem to be changing, so that unexpected or abnormal weather events (prolonged periods of unseasonal cold,wet or drought) seem to be increasing in their frequency and impact on gardeners – and everyone else. This could mean that we need to set aside notions of ‘lateness’ in flowers blooming or not, as the age-old certainties of what and when the different seasons happen is changing. How can we gardeners cope with this increased unpredictability? My second article talked about how we can prepare the garden for this sort of uncertainty – how to create our own, managed ‘micro climate’ if you like. In my last article I talked about how this preparedness needs to be complemented by a watchful, vigilant gardener – I call him/her the ‘Constant Gardener’. A way of gardening which is tuned in to what’s happening in the short to medium term and can take remedial action to further ameliorate or take advantage of the weather we get. Weather forecasting – can we expect longer range forecasting to improve, to give us the forward view we need of how particular seasons are going to go? Plant hardiness and quality – are there any systems for judging and ranking plants to help us? Pests and diseases – what early warning systems are there to help us prevent the worst effects of these in our gardens as the seasons roll on? Weather – can we expect seasonal forecasting to improve? Back in April 2013 here in Norfolk we were forecast (I nearly said ‘promised’) rain over night on two occasions. This failed to materialise so I had to adjust my plant moving plans a little and the continuing dry weather meant I could get on with other weather dependent tasks in the garden. I have to say, I wasn’t that surprised as here in eastern England the progress of easterly tracking weather fronts can often promise rain, only for this to peter out over the rest of the country before we see any benefit. This day to day uncertainty is to be expected and to be honest I can probably live with it, as the weather forecasts, including their useful ‘severe weather warnings’, are generally reliable enough. ‘Our one-day weather forecasts are right six days out of seven, and today’s four-day forecasts are as accurate as one-day forecasts were 30 years ago. While this shows great advances in reliability, we cannot always predict detailed differences in weather at a local level. This is because the atmosphere is an extremely complicated system, affected by a huge number of factors and with the potential to react in endless different ways. To ensure completely accurate forecasts at all times, we would have to greatly increase the amount of observations we get so they cover every part of the planet, every minute of the day. Even then, a supercomputer far more powerful than anything in existence today would be needed to simultaneously process all this information into forecasts. Online Weather services hold a wide range of information including ‘outlooks’ for the month and season aheadOf course it doesn’t help matters when the media gets hold of these longer term forecasts and makes simplistic and crude statements like ‘scorching summer predicted’ and so on. This just discredits the longer term forecasting with all its hedging around with probabilities, if’s and but’s. The Met Office defended it’s work on long-range forecasting following criticism of its forecasts for the Spring and summer of 2012, when exceptionally wet weather hit the UK. The position in North America appears to be somewhat more predictable, though even here there have been exceptional weather events in recent years which may point to a more uncertain future. The larger-scale, continental climate here seems to make it easier to predict things like first and last frost days in different parts of the US and Canada, something that the Met Office doesn’t do, mainly because the weather in the UK is much more variable. So, apart from hoping that longer range forecasting will improve what other weather data can the UK gardener use to inform his timings and techniques? 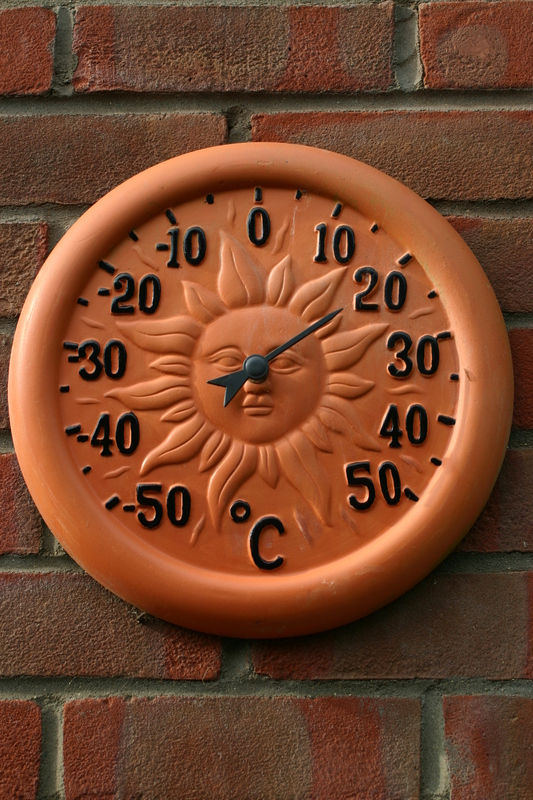 For fruit and veg growers a critical factor is air and soil temperature for germination and planting. Maybe we need to be even more aware of what’s needed for different types of plant- see the examples of this sort of information below. Plant hardiness and quality – what systems are there to help us choose plants that perform and are resilient? Another area of information we gardeners can use to cope with weather relates to plants themselves – their hardiness, resilience to particular extreme conditions and other qualities. In the UK the Royal Horticultural Society has reviewed both its plant hardiness and ‘Award of Garden Merit’ systems. The new plant hardiness system is now temperature based (instead of classifying the UK into four geographical hardiness zones which was the basis of the previous system). Now plants are being put into seven categories from glasshouse plants (H1) through to plants which are ‘fully hardy’ (H7). The RHS Director of Horticulture, Jim Gardiner says he is conscious that in the UK plants have to contend with other factors than temperature when looking at ‘hardiness’ – the condition of the plant itself, prevailing climatic conditions, growing conditions, position in the garden, age, provenance and so on. We also have temperature swings to contend with (RHS – ‘The Garden’, February 2013). So I guess there is a recognition that this hardiness guide (which is currently limited to the plants in the RHS Award of Garden Merit scheme) has its limitations. But, as Jim Gardiner says, it is a system which is plant, not place – based (like the US Department of Agriculture Winter Hardiness Zone approach – see the map below). So, it is perhaps more useful for the UK gardener, where our maritime context and variations in temperature and associated growing conditions can be much more localised (as well as increasingly unpredictable) than is the case in such a large continental land mass. The other main plant rating system in the UK – the ‘Award of Garden Merit’ – is also run by the Royal Horticultural Society, and began in 1922. It received a complete overhaul in 1992 and a ten yearly review cycle resulted in a new list being compiled last year. In addition, following plant trials or round table reviews by plant committees and specialists, new awards are made every year. The ten – yearly reviews ensure that every variety is still available, hasn’t developed disease or pest problems, and hasn’t been superseded by something better. In the 2012 review, for example, the crab apple ‘Comtessa de Paris’ replaced ‘Golden Hornet’, which can suffer scab. In the 2012 review of the nearly 1000 vegetables holding the AGM, 404 were no longer available, so they have been deleted from the list. Excellent for ordinary use in appropriate conditions – a cultivar or selection that outperforms others, perhaps for more flowers, length of flowering, scent, colour, form etc. Just because a plant has an AGM, does not mean it will do well when poorly looked after. A large number of plants hold AGMs at any one time. The current list (which includes the plant hardiness rating) contains over 6000 ‘ornamentals’ and 1000 ‘fruit and vegetable’ varieties and is used in plant gazeteers such as the RHS ‘Plant Finder’ which lists where plants, including AGM holders, can be purchased. A similar system operates in the US, the ‘All American Selection’ (AAS), which is slightly younger and somewhat different to the AGM. The judges and the trial grounds vary from year to year and four categories are judged: Flower, Bedding Plant, Vegetable, Cool Season Bedding Plant, and only never-before-sold varieties are tested. So, the new and updated systems of plant hardiness and quality look like being useful sources of information for gardeners considering which new plants (or maybe replacements) to grow in their particular location and with an eye on future weather extremes. And it is no accident that some experts are starting to identify plants that can withstand particular climatic extremes, like flooding. Pests and diseases – can we get early warning of possible problems? Finally, it is clear that some (if not many) pests and diseases can flourish in different weather conditions. Is it possible to predict how different pests or diseases might affect your garden so that you can take the necessary preventative action? In the UK there are some useful ‘early warning systems’ especially for food growers. For example there is a system for potato blight, which is prone to develop in damp, warm conditions. The Potato Council has offered a blight incident reporting service for 8 years. This information is collected on a voluntary basis by 300 ‘blight scouts’ drawn from members of the potato industry who are routinely walking potato fields during the season. You can sign up to be alerted about blight with the Potato Council. The UK Horticulture Development Company Pest Bulletin provides early warnings of potentially damaging pest attacks and valuable advice for planning this season’s planting of fruit and veg. Providing information throughout the key periods of pest activity, the HDC Pest Bulletins are updated on a regular basis, especially when particular insects are developing rapidly.The HDC also produces a Pest blog. The UK Home Grown Cereals Authority (HGCA) also produces a weekly regional ‘aphid alert’ which you can sign up to. All these systems have their value, but I’m not aware of any system that draws them together for gardeners on a regular, regional basis. Perhaps this is something the RHS might coordinate, incorporating the latest weather forecasts and advice about particular issues affecting different plants? To sum up, there are already a number of sources of information and intelligence available to the gardener that can help ensure a successful garden. Some of these – e.g. longer term weather forecasting and pest and disease warnings – would clearly benefit from further investment and coordination. These can be put alongside measures to prepare your garden for unpredictable weather and adopting an approach to gardening which is ‘watchful and diligent’- the constant gardener. It will also be interesting to see the results of the RHS- University of Reading survey of gardeners and climate change models when it is published- hopefully sometime in April 2014. Together they give me optimism that the gardener of the future will be well equipped to cope with climate change. And we mustn’t forget the importance of adopting sustainable gardening practices as well as a positive move to reduce the ongoing impact we have on global warming and its fuelling of further climate change. One way of monitoring water levels?! If you have any comments on these ideas or have some of your own, I’d love to hear from you! In this third article about climate change and the garden (originally published in 2013), I set out some ideas on how the gardener can manage the day-to-day garden environment and other short-term measures to modify the impact of abnormal weather events. As previous articles have outlined, these seem likely to become more frequent as a result of the warming of the planet and associated climate changes around the world. Developing gardening skills and techniques as well as a flexible, ‘can do’ attitude – or what I’m calling the ‘Constant Gardener’ – the subject of this article. ‘Constant’ implies dependability, ongoing attention and responsiveness, qualities that the ‘climate change gardener’ will need if the gardens of tomorrow are to be as productive, beautiful and healthy as today. Just like Justin Quayle’s ‘gentle but diligent attention to his plants’ in the film of the same name, in fact! The focus of the Constant Gardener is on how those annual and biennial plants that we raise from seed can be nurtured and protected from the worst excesses of the weather. However, attention to how perennials, shrubs and trees are faring will also require vigilance throughout the year and possibly remedial action, if the weather threatens to harm a particular plant or area of the garden. So, what can the Constant Gardener do? To cope with periods of hot sun, consider temporary shades that can be moved around the garden to provide protection for tender plants where there is no natural shade – e.g awnings slung between posts which can be moved to shade beds or borders at risk from ‘frying’. I mentioned the value of permanent structures like pergolas and arbours in my last article. To ensure successful nurturing of plants from seed, sow in smaller quantities and in successive batches – especially if you’re growing food, where successional sowings will in any case give you (hopefully) a steady supply rather than a glut followed by nothing. Carry out plant propagation and nurturing under cover and in frost free spaces – ideally you will have in place a variety of growing conditions, light frost-free rooms in the house, greenhouse/conservatory and cold frame – make sure you use them effectively to harden plants off before they are fending for themselves outside. Choose plants – especially fruit and veg – from varieties that you like to eat and which are resilient or suited to the sorts of conditions you’ve created in your garden and the weather extremes that seem likely (though this itself may be increasingly difficult to predict). For a ‘belt and braces’ approach, grow a few different varieties if you’re not sure about the best ones for you and your garden. Your choice may also mean that you’ll need to compromise a bit on quality as a trade – off for resilience. If you’re buying plants, be vigilant about pests and diseases – with increased plant mobility between countries as well as an increased geographical growing range for some species, the risk of importing pests and diseases is increasing. Delay sowing if your soil is slow to warm up – early sowing is a gamble where the odds are against you, whereas sow a little late and the odds will probably shift in your favour. Be prepared to accept failure and learn from it for next time. Keeping records of seasonal weather, the varieties grown and how they fared is invaluable when growing food crops. If there’s a choice, opt for growing quick food crops – this way there’s less time for them to be affected by abnormal weather. Remember the ‘transfer window’ – make sure you prick out, pot up and pot on regularly, before plants give up the ghost or succumb to ‘damping off’. Aim to grow a few strong plants rather than lots of weaklings! This will make for better resistance to pests and diseases. Rotation plus – you’re probably aware of the importance of moving your food crops around the garden to avoid the build up of pests and diseases associated with one family of fruit or veg, as well as moderating the drain the plants put on the soil’s fertility. The Constant Gardener should also consider successional sowings of the same crop in different parts of the garden if possible (what you might call ‘Divided Bed’ gardening) and if you want to be ultra cautious you could use different varieties too! If plants have suffered from a wet/flooded winter, give them a spring feed, mulch over the root area and give them a foliar feed during the growing season to build up their strength. Use water harvested from wet periods (in butts, barrels or tanks) to water effectively in dry times. Use pipes and ‘SIP’ plastic bottle feeders plunged into the ground to ensure water gets straight to the plant’s roots. Avoid using sprinklers and hoses as much of the water they deposit on the surface of grass or earth evaporates. You could go for a green solar -powered watering system like the one in the picture! Over – winter tender plants in containers in an inside, well-lit and frost-free room or greenhouse, conservatory, or cold frame (ideally with insulation and the scope for added heat when necessary). If they can’t be moved out of the ground, mulch with suitable organic material to protect the roots, and for some wrap up the stem and branches with fleece or similar material. Keep glasshouse, conservatory and cold frame panes clean to maximise sunlight. Look after wildlife and they’ll look after your garden. Feed birds in tough winter spells and create habitats through planting etc. to attract beneficial insects and other ‘critters’ that will keep pests at bay. Avoid using power tools and equipment if at all possible as these will contribute to the emission of CO2 either directly or indirectly and so fuel global warming. Constant action to propagate, nurture and protect your plants! If you have any comments on these ideas or have some of your own, I’d love to hear from you! My final article will look at plant awards, hardiness ratings, pest and disease information and the future of longer term weather forecasting as ways of keeping the gardener well informed. I’m now back from very enjoyable visits to the Scottish Hebrides islands of Mull and Arran as well as Northumberland and will release some posts about this over the next couple of weeks (along with some photos I’m rather pleased with…). In the mean time how about a brief relook at gardening and climate change? I originally published a series of four articles about gardening and climate change in 2013. Today’s reports of a strong ‘El Nino’ effect in the next couple of years coupled with man-made global warming look set to bring about some more dramatic weather events, albeit the results in the UK might be a little gentler than typhoons and droughts (2015 and 2016 the warmest years on record and maybe a cold winter? -we can’t be sure…). In this first of a series of posts about gardening and climate change, I explore just what the experts are predicting for the UK and what this might mean for our current gardens and gardening techniques. I think it was Nietzsche who said that madness comes not from uncertainty but certainty. But for the gardeners of Britain, pulling their hair out in the face of ‘the wrong weather at the wrong time’, climate change and the unpredictable weather it is bringing us can frustrate even the most seasoned horticulturist, though perhaps stopping short of madness! It poses significant challenges to gardening customs and practices, which have in the past been based on the predictable passage of the seasons within fairly certain timings and within, by and large, expected bounds of temperature, wetness, wind and frost (though in the maritime setting of the UK these can all vary considerably from area to area). So maybe we need to look upon these greater levels of uncertainty as a challenge and one which will actually be mentally stimulating! hotter, drier summers, leading to an increased risk of drought. They pointed to how these trends were likely to make looking after large areas of lawn and grass increasingly difficult and costly, and how some traditional garden features may have to be replaced by new ones, more suited to changing conditions (e.g. loss of some ‘cottage garden’ favourite plants). Arguably there is even a greater challenge for heritage gardens, which have traditionally featured large lawns, herbaceous perennials and specific planting combinations and effects which were developed in climatic conditions that will gradually disappear. It also seems that there’s something of a north – south split in the UK, with the south becoming warmer and drier and the north subject to wetter weather, in the winter especially, though recent storms and flooding in the south west and southern Britain might seem to run ounter to this trend. On the plus side, botanic gardens have had to be intensively managed in order to grow the widest possible range of plants in ‘living collections’ and these highly managed environments may provide scope for growing an increased range of plants, as increased temperatures and the other key trends take effect. Botanic gardens are also in a key position to promote and spread knowledge on climate change and its effects. This should give us some optimism that the techniques and conditions for responding to climate change are already well developed and gives the garden an advantage over nature. Though rather slow and insidious, it is already possible to detect some of these trends. The Central England Temperature Record shows that between 1750 and 1900 (150 years) the average temperature in Central England increased by 1 degree Fahrenheit (0.7 degree celsius). During the 20th century this trend advanced faster so that the average temperature rose by a further 1.5 degrees Fahrenheit with two thirds of this increase happening since the 1970’s. This record also shows how 5 of the 6 warmest years since records began in 1659 occurred in the ten years 1989-99. The prevalence of frosts has also declined: an average of 55 frosty days in the 1880’s has reduced to about 35 days by the 1980’s. And closer to home, here in Norfolk, a local gardener has kept records of when certain plants started flowering in her garden from the 1960’s to the 2000’s. Mary Manning’s records show the advancing of Spring: Winter Aconites began flowering in mid January in the 1960’s and by 2000 this had moved to mid December. The same is true of Hazel, which first flowered around the beginning of February in the 1960’s and has likewise moved to before Christmas in forty years. Global CO2 levels seem to be rising by about 1% per annum, though predictions of the future rate and impact of this inevitably vary according to assumptions about economic growth, reductions in carbon emissions and other factors. But although these underlying trends seem increasingly accepted, we also seem to be getting freak frosts, floods or droughts of varying length and intensity – almost at any time of the year, making the normal weather patterns of the seasons less and less ‘normal’. Looking at the underlying trends, the impact of climate change on our gardens will most likely be determined by factors such as plant hardiness and tolerance of excessive wet, or drought conditions (see the chart for one forecast of reductions in water availability across the globe). This poses a challenge to the gardener’s ability to drain land or supply water as needed. So, as gardeners we have to cope with both the longer term trends (which arguably will not be very noticeable in the short term) and, perhaps more importantly, increased frequency of unpredictable, extreme weather events of uncertain length and impact. This ‘seasonal uncertainty’ is perhaps our greatest challenge as well as trying to use gardening practices which help to reduce CO2 emissions and are broadly sustainable. So, lets look upon these new circumstances as a challenge to our gardening skills and respond to nature’s call. In my next post on climate change I’ll be looking at the advance measures we can take to better prepare our gardens for the unpredictable and longer term impact of climate change. If you have any direct experiences of climate change or any other comments I’d love to hear from you. My next article on climate change and the garden will look at how we can be prepared for the unpredictable weather patterns that come with climate change – due out Monday 25th March.